People are often surprised when they hear of concrete flooring being considered as a show surface in a new house. Its utilitarian reputation belies the beauty within. Flooring is one of the most important features to consider when building or remodeling. There are many options to choose from, but concrete stands alone. It has a durability and versatility that is unmatched when compared to other surfaces. Concrete can be sealed with a painted sealer. The benefit of sealed or polished floors is that they are able to withstand staining and absorbing liquids easily. For polished floors, cleaning is as simple as regular sweeping and mopping. Because of its simplicity, the floor will not harbor dust and allergens. With new advancements in concrete these floors do not need to be waxed. They are resistant to moisture transmission due to advanced breathability. For the environmentally-conscious homeowner, this option is sustainable in that no hazardous adhesives or coatings are required. For the frugal, using the original slab saves money as opposed to adding additional surfaces. Polished concrete gives the durability of standard concrete with the brilliant luster of finished ceramic. The shine can be customized from low gloss to near mirror-like finishes. This ability to reflect light provides an aesthetic enhancement in addition to reducing the artificial light needed to fill a room. These floors can be outlined with decorative effects such as colored dyes, engraving and detailed graphics. Dyes allow homeowners to have the floor reflect their personal favorite color. Engraving can add amazing texture, and an extra dimension to feel and touch. And graphics, for the advanced DIY home decor person, can mean you can grace your home with your favourite iconography, or maybe your favourite band logo, perhaps even the family crest. Concrete cleaning involves lifting the stain from the surface itself. Cleaning on a weekly basis is more efficient in that it helps to remove new stains before they settle in and become permanent. It may be difficult to tell when concrete needs cleaning if no visible stains are present. Surface dirt builds slowly, but once the surface has been cleaned the results are usually quite noticeable. Concrete floors can be cleaned by sweeping to remove debris, then washing with water and powdered cleaner. After scrubbing with the cleaner, they should be rinsed thoroughly. Concrete is resistant to physical damage. Concrete has the ability to radiate heat and store solar energy unlike carpet, tile, linoleum or wood. These alternative surfaces are also vulnerable to moisture damage and humidity while concrete is resistant. Because of this, carpet and wood can harbor mold, mildew, dust and other common allergens. a concrete floor poses no danger of sustaining these substances. In addition, it is much more cost effective per square foot over tile, wood or natural stone. They crack easily. While some find cracks to be an eyesore, others appreciate them for the rustic look they can provide. If cracks are too much of a problem they can be masked with concrete overlays. They are too slippery. All smooth surfaces including marble, tile and linoleum can be slippery when wet. 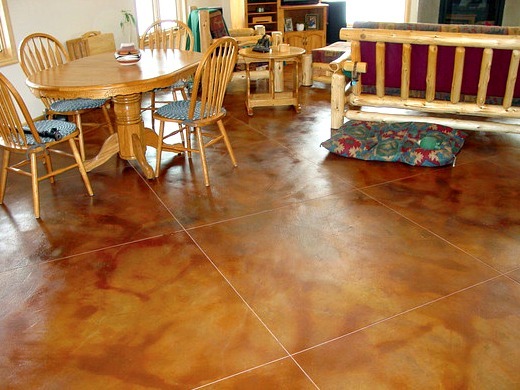 Concrete, however, can be treated with a transparent nonslip additive mixed into the floor’s stain or sealer. They are cold. Concrete is no worse than ceramic or stone in this regard. The difference lies in its ability to store and radiate heat. They are uncomfortably hard. The hardness of concrete contributes to its durability. To cushion a concrete floor, area rugs can be added in common areas such as living rooms. When concrete floors are polished they are extremely simple to maintain. The ease of use is a relief from the many features of a home that require more complex maintenance. Consider concrete as a low-cost and long-lasting option to enhance your home.